Journalism students produce stories, law students hold mock trials and culinary students cook for the public. Students in anthropology, archeology, American studies and historic preservation also need their proving ground, but for these disciplines, it’s all about field study. 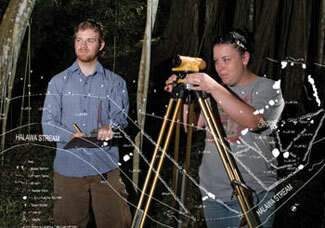 In summer 2007, two University of Hawaiʻi at Mānoa-affiliated groups took advantage of the unique educational opportunities presented on the Big Island to engage students in legitimate research while offering intensive, hands-on training. "For the first time they’re actually doing things instead of just listening to how things are done," says William Chapman, director of the Historic Preservation Program in Mānoa’s Department of American Studies. "You get to do the kind of things that you would do in professional practice. Anywhere in the world the same kinds of ideas apply. I think that’s the main draw." Chapman led students in the Historic Preservation Field School in cataloging historic buildings for the National Park Service in Hawaiʻi Volcanoes National Park. Running concurrently and overseen by Professor of Anthropology Michael Graves, the National Science Foundation-funded Hawaiʻi Archeological Research Project took students into the windward valleys and gulches of North Kohala to record Hawaiian agricultural systems. The work done by students in each of the programs contributes to larger, multi-year, professional projects. With more than 35 years of collective experience leading field schools in Hawaiʻi, the instructors are committed to the programs as essential experiences for emerging professionals. In an area of Hawaiʻi Volcanoes National Park off-limits to the general public, the small group of historic preservation students and instructors gather for the day’s briefing. They’ll be on-site again, making detailed notes about the cluster of buildings that comprises the Kīlauea Military Camp. For visitors, the camp is just another military vacation facility, complete with well-appointed accommodations, a restaurant and a bowling alley. But this group is being trained to see the site with new eyes, beginning with the knowledge that some of the structures available as "cottages" were originally built as prisoners’ quarters and used to intern Japanese Americans during World War II. Graduate assistant Jeff Trip points out architectural detail on a Kīlauea Military Camp structure. Detailed records help ensure appropriate maintenance efforts and support listing on the National Register of Historic Places. At the camp the group breaks up to cover different buildings using the same evaluation form, a simple-looking checklist designed to collect and help systematize data. "It’s basically everything about the building," explains graduate assistant Jeff Trip as he goes over the form. "So we’ll start with single house, part of a multi-dwelling lot, how many stories there are, style, foundation, walls." A familiarity with architectural terms and building styles is essential to completing the task. From the construction of the foundation to the pitch of the roof, every external element is scrutinized and recorded. For the National Park Service, having the most complete data on the structures within their boundaries is essential. The students take the data they collect in the field, round it out with additional information from the park archives and create files for each of the buildings. The immediate goal is to get the structures placed on the National Register of Historic Places, which may qualify the site for federal monies or add interest as a tourist attraction. Another, perhaps more substantive benefit is allowing caretakers to make informed decisions as they manage the site. "When the maintenance people over here say, ’this cottage needs to be fixed up,’ or ’this one’s so bad, we need to do something else,’ they can look into the files and see ’oh, that’s an important contributing structure in the district,’" Chapman explains while standing in front of a row of plantation-style buildings. "Or you look here and you know some of these doors are original doors and some are more recent doors." He points out an especially flimsy-looking modern addition. "And we can say in the files, well, we really prefer these doors. So we start to nudge the maintenance work to bring back the better qualities of the building." William Chapman observes as his daughter assists historic preservation participants Brandon Yockel and Malia Evans-Mason, right, document a building at Volcanoes National Park. Since 1991, field schools have documented ʻIole Mission Station and Hilo’s historic downtown district on Hawaiʻi; surveyed Kalaupapa on Molokaʻi; and worked at Ewa Plantation, the Capitol District and various neighborhoods on Oʻahu. 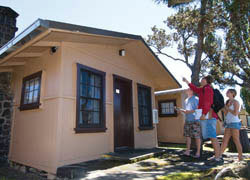 Students in the program gain practical knowledge about the layers of bureaucracy in which sites, such as the Kīlauea Military Camp, are sandwiched. "Here the military owns the buildings, but the park service owns the land, so they have to be coordinated," says Brendan Yockel, a graduate student in urban and regional planning who is doing his thesis work on the site. For Yockel, the entire field school was a crash course of sorts, but one that gave him a leg up in his research. "It’s been very practical, first we learned about the history of historic preservation, types of historic preservation, different legal issues that the park faces and the jurisdictions involved, stuff like that. But were also learning a lot about architecture, different features of buildings…I didn’t know anything about that before this." Originally from the Big Island, undergraduate Malia Evans-Mason is one of a growing number of Hawaiian students who seek to leverage academic training with the ability to protect culturally important sites. "It’s a political issue. Anything that has to do with the government, you have to learn how to work your way. What makes a site historic to some doesn’t necessarily make it historic to others and so you need to be knowledgeable about the laws and criteria to protect these places. That’s why I’m here, to learn what the process is." Evans-Mason plans to apply to the new applied anthropology program at Mānoa. The program has a geographic and cultural emphasis on Hawaiʻi, Oceania and Asia and is intended to help meet the steady demand for professionally trained cultural resources managers. She also has her eye on attending the Hawaiʻi Archaeological Field School operating on the north side of the island. In a large country house near Kapaʻau, students from schools across the country (including two Hawaiʻi-born participants) are finishing dinner in the company of noted professional archeologists. The work of the field school students, who earn a stipend for their participation, will generate about half of the data in a large-scale archaeological research project, and rubbing shoulders with involved experts is just another perk of the field school experience. After cleaning up the meal, the students settle in front of their laptops, maps and notes to continue work on their final course projects. "We focus on students who might not otherwise come into science," explains Graves. "Women, people of ethnic groups not well-represented in archaeology today, people with physical disabilities—we’ve been trying to give opportunities to a variety of students." The project that commands their attention this year is the mapping, measuring and dating of a long but not unbroken series of irrigated terraces, loʻi, on the wet windward side of the island, where no archeological work had previously been done. Rock walls stacked alongside Hālawa Stream are just a portion of the extensive agriculture system, which may have grown the kalo (taro) that fed Kamehameha’s army, explains graduate assistant Mark Oxley while leading a short hike down to the site. "The sugar plantations destroyed a lot of the archeology up on the surface, but I think we’re really lucky that the gulches have been fairly untouched," he says, pointing out the surviving terrace walls and marveling at the skill of the builders. "This year we found sites that just blew us away. This site is comprised of 6 or 7 terraces, but a place called Makapala has 113 terraces. Just huge, massive, intensive agriculture. Really amazing." He’s calm but gleeful as he carefully navigates the stones that cross the river. "There are rumors that this is the most intense wetland loʻi agriculture that we’ve seen, anywhere in Hawaiʻi." Like historical preservation, archeology is a way to understand the history of a place, and the disciplines often overlap. "Archeology plays an important role in historic preservation because we have resources that often are very important, can be unique and may be endangered as well because of land development activities," explains Graves, who has taught classroom portions of the historic preservation certificate. "These agricultural sites are places where regular people lived and farmed and spent their lives, and their history is important as well." Oxley says his participation as an undergraduate spurred his academic career. "Last year at the end of field study, I knew that archaeology was it for me," he says. His mentor Graves considers field school experience an essential part of students’ decisions about whether to continue in anthropology or archaeology. At least three-fourths of the students won’t, he estimates. Yet even they find the field school experience valuable. "Field school is really the archetypal collaborative form of research. This is the way in which most science is done these days," he says. "We’re teaching the skills that a physicist would use, a botanist would need, an engineer would employ." There’s another benefit, he adds. "Ideally what we’re teaching here, and what Bill is teaching in his field school in Volcanoes, is not only about the documentation of sites necessary for historic preservation compliance, but also a way of looking at resources that helps preserve them, that does the least amount of damage to them, as we gain information about them." Students interested in joining a field school should watch for announcements on Mānoa’s Anthropology Department and Historical Preservation websites.